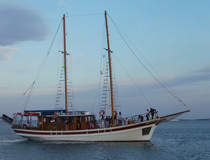 Chartering a yacht or a catamaran for your wedding venue will definitely impress your guests! 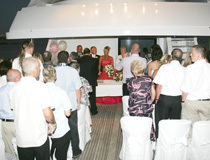 Here’s the chance to charter your own catamaran or yacht on your wedding day - a most magical setting for you and your guests. 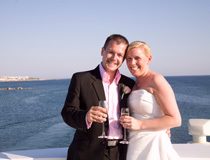 Yacht wedding options include 2, 3 or 4 hours sailing with your own skipper and crew, civil ceremony conducted on-board by the local Registrar, decorations, a champagne reception & buffet, music, plus a complimentary day cruise for bride & groom to enjoy during their honeymoon. To give you an idea of what can be arranged on your behalf, click here to view our very luxurious Yacht Wedding Package that includes a huge range of extra special touches (cheaper options with less inclusions are also available). to 150 persons. And to add even more magic to your day, we could also arrange for a spectacular fireworks show that you and your guests can enjoy from the deck!